“Pocket Bunker™ is a fantastic product, because you can use it to practice your green-side bunker shots, but actually off any surface, like grass, a carpet, anywhere.” – Head PGA Professional at The Els Club Copperleaf, John Dickson. Thrilling tranquility. All golfers want to play great golf, experiencing the thrill of hitting great shots on great golf courses. Practicing with Pocket Bunker™ will assist golfers to do exactly that when playing green-side bunker shots. Practice with your Pocket Bunker™ and expect to be amazed. Pocket Bunker™ is about you reaching a level of green-side bunker shot performance you thought only bestowed on professionals. Pocket-sized, it is crammed with performance, convenience, durability, value and enjoyment. Playing off a low or high handicap, lose your fear of bunkers, become confident, attack the pin and enjoy the result. Imagine taking the legs out from under the ball. Performance. 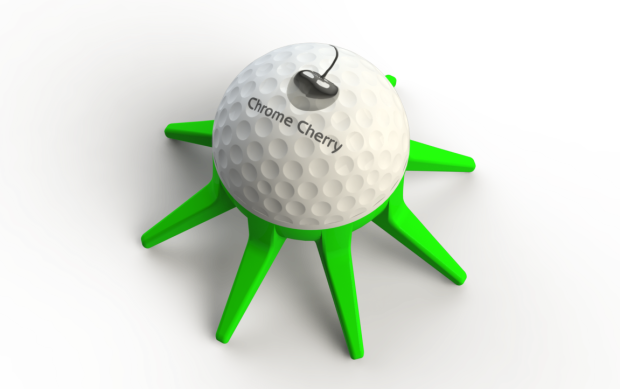 Pocket Bunker™ closely resembles a PGA approved golf ball, except that it has legs that act as sand simulators. Pocket Bunker™ played from just about any surface reacts just like a golf ball from sand. Pocket Bunker™ is no gimmick – it lets you know exactly how good you hit it, just as if you are in a bunker. Resistance generated between the club and the playing surface provides realistic feel, especially with good shots. Hit it fat and it stays behind. Hit it thin and it flies over. Shank it, and it will go sideways. Hit a good Pocket Bunker™ shot and it reacts like a good bunker shot. Convenience. Pocket Bunker™ is soft with flexible legs. It can be used at home, at school, in the park, at work, at practice facilities – anywhere. It fits easily in your pocket, making it ideal to carry on you when you want to fit in a quick session. Pocket Bunker™ is perfect to throw into your golf bag with your other balls. So when you want to have a quick bunker warm-up session before your next round, you can just take out your Pocket Bunker™ and do it right there around the 1st tee. Take it along to your next PGA Professional lesson, and use it to drill in your newly acquired technique. Durability. Pocket Bunker™ is extremely tough. It is made from materials boasting excellent impact, yield and tear resistance properties. It is good for 1000’s of practice shots. Value. Pocket Bunker™ will not break the bank while helping you breaking your target score. Priced far below the value it provides, expect to not suffer from any buyer’s remorse after getting your own. Consider comparative cost of equipment, facility access, transit cost to facilities and professional coaching fees, and you will see that Pocket Bunker™ comes in at a very attractive price. A small yet significant investment in your game. Use the money you save to buy a new sand wedge. Great even if you are only considering to take up golf – it may just give you enough inspiration to go all-in. Enjoyment. No age restriction here. Always have fun with your Pocket Bunker™. A mini bunker contest at home next time you invite your friends and family over will provide hours of competitive fun. Great for kids – it will keep them busy for hours, and they won’t even notice they are working hard at becoming a great golfer. Add it to your #1 range of equipment. Use equipment that best suits your game. You are serious about your performance – Pocket Bunker™ is an essential part of your kit. Your #1 bunker shot perfecting tool. Use it in sand. Although designed and developed to play of surfaces other than sand, Pocket Bunker™ also works great when used in sand. So, if you have access to well-maintained sand bunkers, you really also want to use it inside the bunker to improve your bunker shots. Here it is a great visual aid, again with accurate response, perfectly simulating the sand bunker shot. It is as if you are using a normal ball, but you are guided by the legs. “And it is great for your Flop Shots too!” – John Dickson. Pocket Bunker™ will also improve other areas of your short game – regarded as the scoring part of the game – especially flop shots. The only difference from the bunker shot is that you will hit Pocket Bunker™ slightly thinner than the good bunker shot. Now you are really geared to lower your score! An excellent way to market your company! 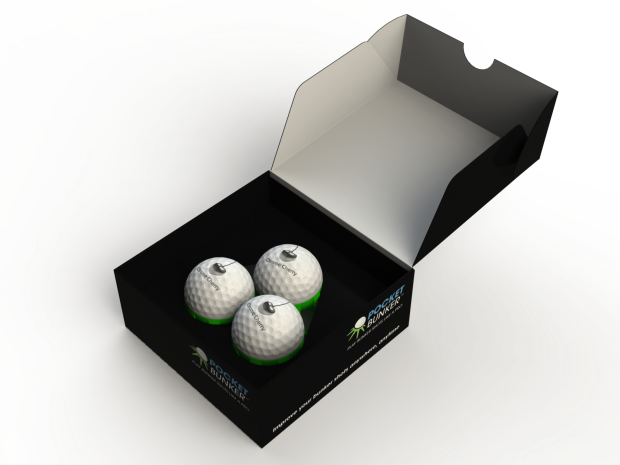 Pocket Bunker™ can be branded with your company logo, just like a normal golf ball. Be one of the first to get your customers this stunning gift they can really put to use. One that will last a long time, as will be their memory of your kind gesture.